Google’s chief executive Larry Page might not be getting as much of the press attention as Apple and its post-Jobs leader Tim Cook, but with Android now effectively dominating global smartphone sales, it is hard to underestimate the impact Google has. If we had to compare Google and Apple, it seems the two stand for radically different business models, extremely different approaches. What’s interesting about Google however is not just its current products, but also the unique way by which it is organized. The search giant started with the 70/20/10 model, where 70% of its effort was dedicated to ads, 20% to apps and 10% to brand new projects, and has retained this profile up until this day. With this look at the future embedded at the core of its principles, Larry Page explains how Google relates to Apple, gives some more details on his relationship with Jobs, and speaks about things like a possible Motorola Nexus to how he runs Google. All of those are extremely insightful and interesting thoughts, we strongly suggest you checl out the full interview Page gave for Fortune at the source link, but we have also selected some excerpts right below. “Question: So in light of that, Apple's still a partner. It's a competitor. You and Steve Jobs were friendly. Q: At times. You said that whole thing about Android and them being angry about it, that it was for show. LP: I didn't say that entirely. I said partly. Q: [Apple did it] partly for show, to get the troops to rally. “First of all, I don't think there's any physical way we could have released a Nexus Motorola device in that sense [this year]. I mean, we haven't owned the company long enough. "If you're looking at somebody else, you're looking at what they do now, and that's not how again you stay two or three steps ahead." We're still 1 percent to where we should be. I feel a deep sense of responsibility to try to move things along. Not enough people are focused on big change. Part of what I'm trying to do is take Google as a case study and really scale our ambition such that we are able to cause more positive change in the world and more technological change. I have a deep feeling that we are not even close to where we should be. The news of a possible Motorola Nexus makes me anxious so see what Google has up its sleeves for 2013.
the sound of it makes me drool. 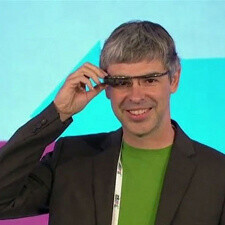 besides, it makes perfect sense for Google to give Motorola a push. What about the self-driving car? It is in the main source. Concept is great but how about fuel? Great, thanks for the help. About the fuel, well, the cars can be electric or hydrogen fueled cars. but it's highly unlikely it will happen in a near future (too many bumps in the road: fuel companies, car companies, R&D, technology costs, traffic system, government, current technology). But it will happen... I hope to live long enough to see this. A Moto Nexus would be awsome! Yeah, it figures after I extend my contract they'd talk about a Motorola Nexus. But that's why I went with the Razr Maxx HD, it's the closest right now to a Motorola Nexus given the absence of MotoBlur, with the best battery life. I like the comment about not being able to release a Nexus because they haven't had Motorola that long. I said the same thing when the Razr HDs were announced. I actually like the idea they took the existing flagship phones, dumped the rest, and cleaned them up. I also said next year is going to be the true test to what they can come up with since then they'd have a full year of R&D to work with. If Motorola step up their camera hardware they could really have a hit with a Nexus line. A Razr Maxx Battery, Compact almost bezel free design, durable kevlar and bundle that with the latest and greatest Android OS, It would sell like hot cakes, even more so if they sell them as cheap as the Nexus 4. Hell to the yeah about the Motorola Nexus!!! I own a Motorola Xoom and still loves it to this day!!! Being a Chicagoan and where Motorola started and is based in, I would definitely embrace a Nexus device from the them. lol, i wonder who went nuts with the red thumbs. my guess is a cynical ahole. O dear, Mr. Larry. How profoundly cincere you sound, it makes me take out my smallest violin and play a song for your hypocrisy. You and Mr. Eric are the two main thieves behind the semi-product, called android. A Moto Nexus is probably the only Nexus I would get. I have had too much good luck, experiences with Moto vs other manufactures....for my wants n needs. hello moto here's nexus,..hi moto bye moto.